Will craft brewery help Richmond shed its Old South image? These are some of the beers offered by Stone Brewing Co.
Richmond has made various attempts in recent years to shake its image as a staid (but dangerous) Southern city that never gave up on the Lost Cause. It has created an arts district, won the rights to host an international cycling race and attempted to build a new baseball stadium in the oldest section of town. Nothing, however, might do more to rid Richmond of its old reputation than the anticipated arrival of Stone Brewing Co. In October, California-based Stone announced that it had picked Richmond for its East Coast brewery and bistro, ending a competition that initially involved 200 sites in 20 states. The other finalists were Roanoke, Norfolk and Columbus, Ohio. Stone is expected to invest $74 million and create 288 jobs in an economically depressed part of the city. Nonetheless, the rich incentive package offered to Stone, worth more than $30 million, infuriated many local restaurant owners who felt the city was subsidizing their competition. In the end, City Council unanimously approved key elements of the deal in March. Amid the euphoria and the fuss, one fact was overlooked. Richmond is not the sole city where Stone is making a grand entrance. It also is building a brewery in Berlin, with a goal of conquering the country most identified with beer. That’s a gutsy move, but it fits perfectly with Stone’s corporate culture and the spirit of the craft beer movement. Stone is the ninth-largest craft brewer in the U.S. Typically small operations with only a handful of employees, craft brewers see themselves as the entrepreneurs, if not the insurgents, of the beer industry. They hold a small but rapidly growing market share in a $100 billion industry where overall sales rose only 0.5 percent last year. The number of craft breweries in Virginia has soared in recent years to more than 100 today. Richmond has about a dozen. Craft breweries resonate especially with millennials, that cohort of the population born between 1980 and 2000 whose numbers rival the baby boom generation. Like boomers, their preferences and attitudes are reshaping the culture. For millennials, the number of craft brewers in a city is a sign of its desirability as a place to work and live. In fact, craft breweries probably could be used as an indicator of a community’s millennial magnetism in the same fashion that the locations of Whole Foods and Cracker Barrel stores have been used to predict the Democratic and Republican leanings of counties throughout the U.S.
Asheville, N.C., offers one example of how the growing presence of craft breweries can enhance a city’s image and its economy. Asheville was named the best beer city in the U.S. in 2010 in an online poll. That accolade added a new dimension to the city’s existing reputation as a mecca for artists and hikers. When, like Stone, the Sierra Nevada and New Belgium breweries were looking for East Coast locations, in 2012 and 2013, respectively, Asheville was their choice. The result is more than $260 million in investment and about 350 jobs. The unemployment rate in the Asheville area was 4.4 in March, lower than Northern Virginia’s 4.7 percent. Now that Richmond is Stone’s choice, city residents are getting to know the company better. The VCU School of Business Foundation recently sponsored a reception featuring two Stone officials, Pat Tiernan, its chief operating officer, and Craig Spitz, its CFO. As the executives sipped cups of beer, Spitz summed up the company’s approach “We have not tried to be all things to all people...Our philosophy has always been: Build it and they will come.” Stone, which is known for bold-flavored ales, does not conduct focus groups and shuns traditional advertising in favor of sponsoring events and using social media. 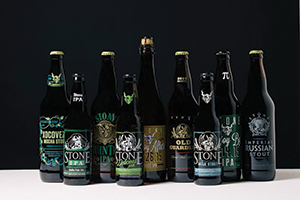 Stone also has no ambition to be the nation’s largest craft brewer. “It is not a matter of being the biggest, but being the best … Quality is everything,” Spitz said. Community involvement is also a key company value. In fact, the chance to change a neglected part of Richmond played a key role in the site it chose for its brewery and bistro. Stone initially looked at sites in Richmond’s old Manchester area, south of the James, because of its interstate access. The company, however, became intrigued with the Greater Fulton neighborhood on the north side of the river. Much of the neighborhood had been bulldozed decades ago in an urban renewal project and never rebuilt. “It was a unique opportunity to make an impact in the community,” Tiernan said. Maybe Richmond can aid Stone in its invasion of Berlin with a few lessons on the rebel yell.